Our two sportive guinea pigs have just three weeks to go until a date with their 100-mile destiny. When Cycling Active first met Gareth and Nicola Harries earlier this year, road cycling really was a foreign discipline to them. They had never used drop handlebars, or clip-in pedals, or worn Lycra, or drunk from a water bottle on the go. So there were the customary slips and spills as two people came to terms with a new sport (not least when Gareth fell off his bike the first time he rode it — an understandable event, you might well think, until you realise it was on a turbo-trainer at the time). But in just seven months, Gareth and Nicola — two busy veterinary surgeons who, like many people, have had to squeeze the cycling miles in around hectic professional and social lives — have shown admirable commitment to their cause. They have found the time needed to continue the path towards becoming ‘century sportivistes’, and now they stand three weeks away from the goal that started it all: a 100-mile ride. But despite the progress Gareth and Nicola have already made, they haven’t used the summer months as an excuse to slow down. If anything they have been pushing themselves harder. “The cycling bug certainly made a big impact on our holiday plans for the year,” Gareth explains. “Suddenly we found ourselves looking at destinations in terms of suitability for training. The completion of the Roses Round Sportive’s 75-mile route in June gave us the confidence to know what we could achieve, so we headed off to Cornwall for a break. We might have had just a bit too much confidence, because before we left, while looking at a map of the area, Nicola said: ‘There’s nothing over 300 metres high so how hard can it be?’ That comment would come back to slap her in the face! 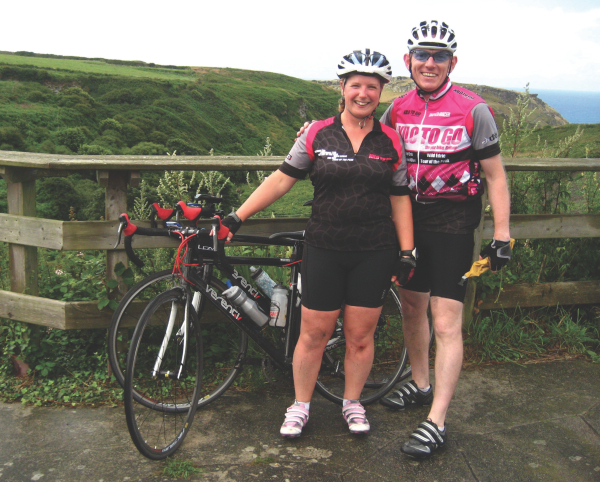 “Our chosen accommodation turned out to be just off the route of the Cornwall Tor Sportive. This was more by accident than design, so I guess there must have been a finger or two from the hand of fate involved. Picking sections off the Cornwall Tor route provided us with training challenges as well as getting to see some wonderful scenery. It was a holiday after all. After the pleasure and pain of Cornwall, Gareth and Nicola headed back up north to Cheshire to tackle part of the Tour of Britain route nearest their home in Staffordshire. “The descents past the Roaches are an absolutely awesome rollercoaster,” Gareth says. And putting the final seal on their transformation into ‘real’ cyclists, they have just come back from a serious session of rides on tough continental roads — all fuelled by fine German cuisine, cake and coffee. “After returning to work for a few weeks, we headed to a wonderful guesthouse, Haus Erika, in Wieden [www.blackforestbreaks.com], high up in the hills of the Black Forest, in Germany,” Gareth says. “Our first long ride turned out to be 70 miles, with much of it in a bit of a monsoon, but at least the rain kept us cool. Inevitably, the sun came out for the final 300-metre climb back to the guesthouse. After that, we did a 50-mile ride over the Rhine Plain and wine-growing area near Freiburg, and then upped the mileage to an 85-mile route to really test our legs. Next stop: Stoke-on-Trent and the 100-mile challenge. Gareth and Nicola visit the Human Performance Lab at Oxford Brookes University for initial fitness tests. New bikes arrive. The month is spent sorting out set-up and position in the saddle. Short, simple rides to get used to drop handlebars. Gareth and Nicola master their clip-in pedals while upping the distance towards 50 miles on long rides, preparing for their first organised event. The first sportive, Squires and Spires, is a hard, wet and slightly shorter than expected affair. Later in the month, Gareth and Nicola pass the 50 and 60-mile ride landmarks and spend the month mastering hydration on the go. Another soggy experience at Gareth and Nicola’s second sportive — the 75-mile Roses Round in the hills of Lancashire and Yorkshire. Down south for a spot of relaxing and riding in Cornwall. Still keeping the mileage high while taking the chance to check out some of the tougher coastal climbs. Cycling experience is raised another notch among the mountains of the Black Forest. Some serious climbing and rides of 85 miles in advance of the day of reckoning: the Prostate Cancer Charity Tour Ride, Stoke-on-Trent, September 26 2010.